Edmonton, Alberta--(Newsfile Corp. - March 4, 2019) - Benchmark Metals Inc. (TSXV: BNCH) (OTCQB: CYRTF) (WKN: A2JM2X) (the "Company" or "Benchmark") is pleased to report a large radiometric geophysical anomaly covering approximately 50% of its newly acquired ~20km2 Lawyers Extension Property. Together with the adjoining ~100km2 property of the Lawyers Gold & Silver Project, this extension brings the known length of Lawyers Trend to at least 20 kilometres. The Lawyers Trend is located in the prolific Stikine Terrane of the Toodoggone Mineral District, which also hosts the Golden Triangle region of British Columbia, Canada. CEO John Williamson commented: "The radiometric anomaly is coincident with historical and recent gold and silver results at the Lawyers Extension, further supporting our hypothesis of a regional scale gold and silver system. In addition, the north-south striking E-Grid Target that lies outside of Lawyers Trend is also coincident with a radiometric anomaly and gold and silver mineralization. The emergence of such a widespread regional mineralized system contained within our property area is another great milestone for our team and it bodes well for the investors who share in our successes as we continue to systematically identify and explore large land packages for multimillion ounce resources." The following location map and geophysical signatures across the Lawyers Trend. At the Cliff Creek (CC), Dukes Ridge (DR), Phoenix (PX) and ABG zones, a large 5km by 4km radiometric anomaly is coincident with potassic alteration, anomalous soil and rock geochemistry and high-grade gold-silver drill results. The K/Th ratio from the radiometric aerial survey highlights areas of known mineralisation. The strong response is due to the addition of potassium to the rock when they are altered by the mineralizing fluids, making radiometrics a very powerful targeting tool. The magnetic response also highlights the areas of alteration and potential structural trends, and is useful when used in conjunction with the radiometrics and field mapping. Drill intersections of 5.76 g/t Au, 128.65 g/t Ag over 33.52m, including 52.02 g/t Au , 846.44 g/t Ag over 3.05m at Dukes Ridge, will increase the maiden resource estimate. 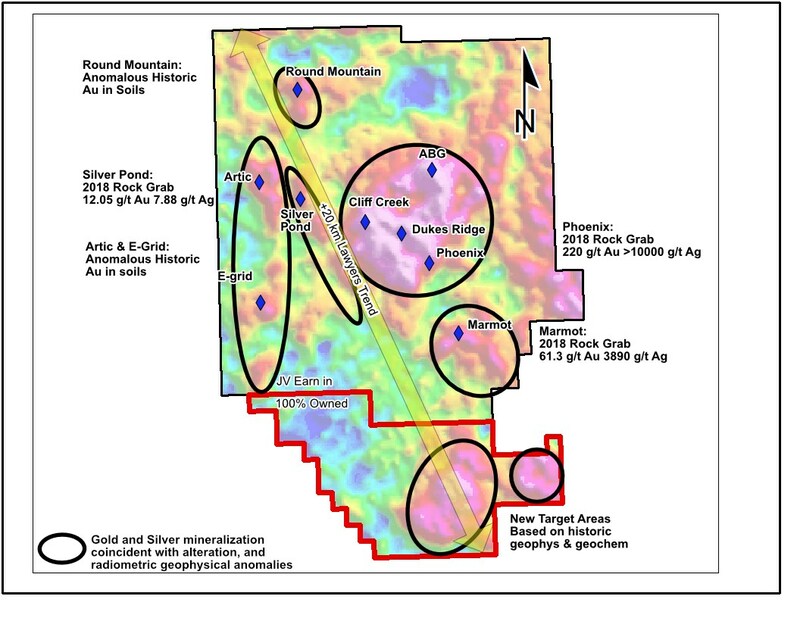 As well, Marmot Zone has provided anomalous gold-silver rock samples at surface, including up to 61.3 g/t gold and 3,890 g/t silver in selective samples (reported November 22, 2018). Radiometrics have expanded the Marmot signature to an area of ~1.5 km2. The new magnetic, electomagnetic and radiometric data will aid in delineating new targets for drilling and focussing resource expansion drilling in 2019.